Beijing Design Week has selected Barcelona as the guest city for this year’s festival. Barcelona, like Beijing, is a city full of design inspiration regional capital of design practice. 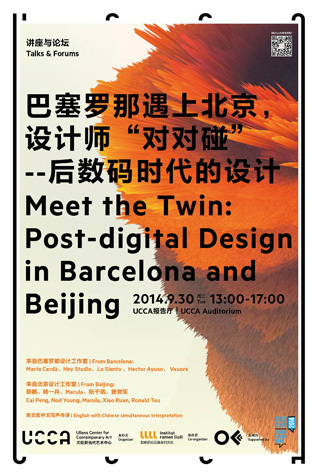 For this event, designers from Barcelona and Beijing will discuss design practice as it migrates across borders, exploring the potential for cultural difference and exchange to act as creative tools. Ticketing & Participation: Free, ticket required. You can collect your ticket from the ticket desk 30 minutes before the event begins. Please bring an ID card to rent simultaneous interpretation audio equipment.